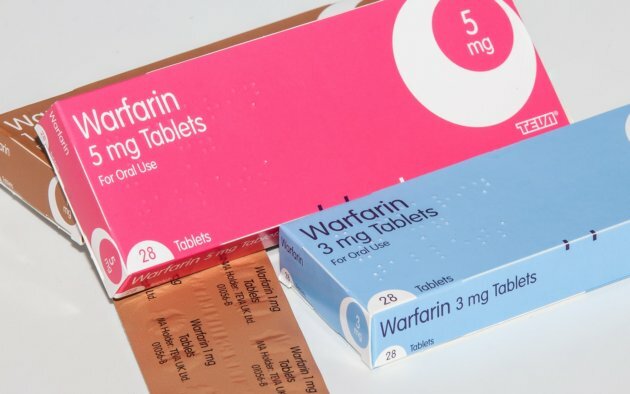 Warfarin is a drug often prescribed by doctors to help treat blood clots, though you may be more familiar with its brand names, “Coumadin” and “Jantoven.” But, as with many medications, there are warfarin side effects such as drowsiness, blurred vision, or brown urine that you should closely monitor. In addition to Coumadin side effects, you should also be aware of the drug’s impact on health conditions such as pregnancy, as well as what you should and shouldn’t do while taking it. Warfarin sodium, as it is sometimes called, is not only used to treat pre-existing blood clots, but it is also used to help prevent blood clots from forming. Untreated blood clots may lead to life-threatening complications such as deep vein thrombosis or pulmonary embolism. While warfarin is a valuable drug that can save numerous lives, some side effects of warfarin should not be ignored. You will want to make a mental note of less severe side effects, while severe side effects warrant a call to your doctor. Serious side effects require immediate medical diagnosis and care. The following table is a guide to the various side effects of the blood-thinning medication and what actions to take should they arise. It should also be noted that, in very rare cases, warfarin can cause some areas of the skin to die as a result of protein C deficiency. This is called skin necrosis. If this occurs, seek medical attention immediately. An increased amount of vitamin K in your system may reduce the effectiveness of warfarin. However, decreasing the amount of vitamin K in your system, especially by drastic amounts can have a similar effect on the drug, as well as create issues for your body. The key is to keep the vitamin K in your body approximately the same from week to week while on the medication. This can be done by maintaining a consistent dietary intake each week. Do not make any major dietary changes without consulting your doctor first. A major shift in your body’s nutritional system can impact warfarin’s effectiveness. Given the potency of warfarin and the side effects that it can produce, if you have any of the following conditions, you may want to avoid the drug. At the very least, consult with your doctor and be sure to inform them of your health status. Keep your doctor informed: If you start suffering from a side effect, let them know. Keep them up to date on your medical history and any medications that you are taking. Medical identification: Having a bracelet or a card on your person explaining that you are on warfarin is a good idea. If you end up in a medical emergency, it is important for the doctors to know that you are on warfarin. Lifestyle changes: Do not make any major lifestyle or dietary changes without consulting your doctor. Warfarin is a complicated drug that requires a fair amount of balance in your system. Substantial changes may affect the usefulness of the medication. Blood clotting is the body’s way of preventing excessive bleeding following an injury. However, harmful blood clots can cause major damage to your health, including strokes, heart attacks, and possibly death. Warfarin can help treat damaging blood clots. That being said, it is very important to talk to your doctor before it is prescribed due to its various interactions with medications and possible side effects.Keep an eye on the abovementioned side effects of blood thinners like warfarin, noting the severity and corresponding action to take. Be sure to monitor your dietary intake, as both vitamin K and alcohol can limit the effectiveness of the drug.It may seem like a nuisance to deal with on top of potentially fatal blood clots, but your vigilance could make the difference between life and death. Side Effect Less Severe Severe Serious What Should I Do? A general feeling of discomfort X Mention it to your doctor on your next visit. Red or brown urine X Seek medical treatment immediately. Blurred vision X Speak to your doctor as soon as possible. Severe headache or stomach pain X Seek medical treatment immediately. Drowsiness X Mention it to your doctor on your next visit. Bleeding gums X Speak to your doctor as soon as possible. Excessive bruising X Seek medical treatment immediately. Joint pain and muscle pain X Mention it to your doctor on your next visit. Dizziness, faintness, and or lightheadedness when rising up suddenly after sitting or lying down X Speak to your doctor as soon as possible. More susceptible to cold X Mention it to your doctor on your next visit. Excessive sweating X Speak to your doctor as soon as possible. Black or bloody stool X Seek medical treatment immediately. Bloating X Mention it to your doctor on your next visit. Difficulties with swallowing X Speak to your doctor as soon as possible. Irritated skin that is red and or itchy X Mention it to your doctor on your next visit. Severe bleeding, including heavier than normal menstrual bleeding X Seek medical treatment immediately. Sores, welts or blisters. X Seek medical treatment immediately. Chest pain and discomfort X Speak to your doctor as soon as possible. Hair thinning or even hair loss X Mention it to your doctor on your next visit. Excessive gas X Mention it to your doctor on your next visit. Stomach pain with cramping X Speak to your doctor as soon as possible. Unexplained swelling X Speak to your doctor as soon as possible. Vomiting of blood or material that looks like coffee grounds X Seek medical treatment immediately. Bruising that develops without an injury you remember X Seek medical treatment immediately. “Warfarin,” RX Wiki; http://www.rxwiki.com/warfarin, last accessed September 11, 2017. “What Is Warfarin (Coumadin and Jantoven)?” Everyday Health; https://www.everydayhealth.com/drugs/coumadin, last accessed September 11, 2017. “Warfarin, Oral Tablet,” Healthline, August 21, 2017; http://www.healthline.com/health/warfarin-oral-tablet#highlights1, last accessed September 11, 2017. “Warfarin,” NHS Choices; http://www.nhs.uk/conditions/Anticoagulants-warfarin-/Pages/Introduction.aspx, last accessed September 11, 2017. “Warfarin Side Effects,” Drugs.com; https://www.drugs.com/sfx/warfarin-side-effects.html, last accessed September 11, 2017. “Warfarin – an anticoagulant (Marevan),” Patient; https://patient.info/in/medicine/warfarin-an-anticoagulant-marevan, last accessed September 11, 2017. Bussey, H., “FAQs About Warfarin (brand name Coumadin),” ClotCare Online Resource, originally published March 2000, updated December 2006, http://www.clotcare.org/aboutwarfarin.aspx#sideEffects, last accessed September 11, 2017. “A Patient’s Guide to Taking Warfarin,” American Heart Association; http://www.heart.org/HEARTORG/Conditions/Arrhythmia/PreventionTreatmentofArrhythmia/A-Patients-Guide-to-Taking-Warfarin_UCM_444996_Article.jsp#.WbaxLdOGOLK, last accessed September 11, 2017. “Warfarin necrosis,” Wikipedia; https://en.wikipedia.org/wiki/Warfarin_necrosis, last accessed September 11, 2017.